COLOR: Purplish-brown body with a purplish saddle shape on its green back. 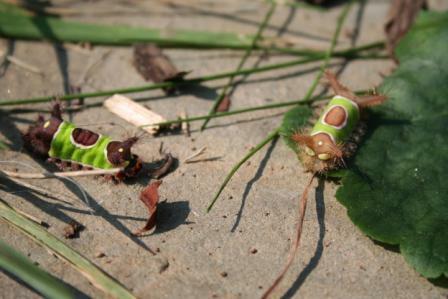 DESCRIPTION: Distinctive caterpillars with one inch long poisonous spines that stick out from the sides of the body. The "saddle" consists of an oval purplish-brown spot in the middle of a green patch on the back. Saddleback caterpillars feed on the leaves of oak, fruit trees and other trees and shrubs. HABITAT: Usually found on shade trees and ornamental shrubs in late summer or early fall. TYPE OF DAMAGE: Contact with the poisonous hairs or spines causes a burning and inflammation as painful as a bee sting. The pain can last for a day or two and may be accompanied by nausea during the first few hours. Reddening and swelling results much like a bee sting. CONTROL: Wash the affected area to remove any hairs and poison that remain. Ice packs will help reduce swelling, and vinegar or orange oil will lessen the discomfort and promote healing. Persons known to be sensitive to insect stings should consult a physician. Stinging caterpillars rarely occur in numbers to be plant pests, but people working with ornamental plants should learn to recognize them and avoid touching them.